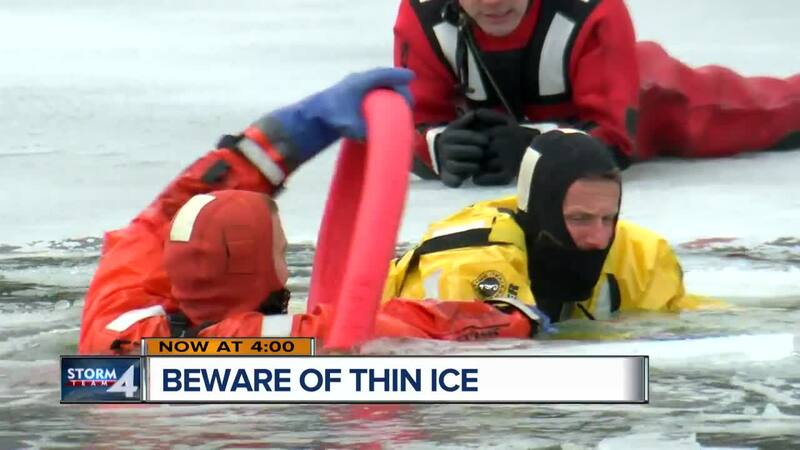 With temperatures warming up, firefighters are warning people to stay off the thin ice. A change of the seasons has North Shore Fire and Rescue warning people to stay off the ice. Fire crews spent Wednesday on the Summerfest Lagoon to train for ice rescues on the same ice where fishermen were dropping lines. Every spring, North Shore Fire crews put on their wet suits to be ready for the call in case someone goes through the ice into frigid 33 degree water. "You may have just seconds before you end up under an ice shelf and aren't able to rescue yourself," North Shore fireman Dan Tyk said. Tyk and his fellow firefighters practiced a variety of techniques for different scenarios by using ropes, harnesses and inflatable boats on open water as the air temperature climbs well above freezing. "Obviously the conditions are not perfect for others to be out on the ice and that's kind of our message," he said. Just about a hundred yards away from the rescue crews practicing in the water, several fishermen could be spotted less than 100 yards away. Tyk said ice thickness varies this time of year from 0-6". "Ice fishing season is over," Tyk said. "There's no guarantee that the ice underneath you, the conditions can change rapidly." One of those ice fishermen is Brian Siminak who was hoping to catch dinner with friends and family. "Trying to get some steelhead and brown trout," he said. Despite the fire department's warnings, Siminak isn't worried about falling through. "It's getting a little soft and spongy with the warm days, but hopefully we still have a few more days," he said. There are different levels of ice thickness and the weight each can withstand. You should stay away from any ice that's two inches or less. Ice fishing is safe at four inches or more. ATV and snowmobiling is considered safe at five inches or more.